Nightly writings with Ms Moore – the pen equivalent to the little black dress. 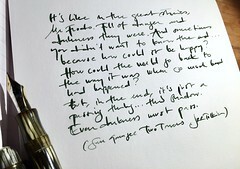 Springy nib suitable for letters and poetry. The ink is J Herbin Ambre de Birmanie.